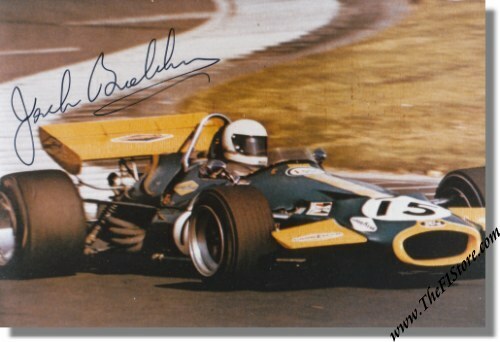 Sir Jack Brabham signed 1970 Mexico Grand Prix Photo. Here we have a photo of Sir Jack during his very last Formula 1 race, the Grand Prix of Mexico 1970. Unfortunately, Sir Jack would drop out of the race with his Brabham BT33 Ford in lap 52 with engine trouble. This race was his last Grand Prix ever! This photo has been hand signed by Sir Jack. This is a very rare opportunity to own a great item signed by one of the worlds greatest racing drivers and items like this will surely appreciate in value.